I tried, but I had to quit after 6 episodes. As of this time, The Price of Smiles has failed miserably in an attempt to display both sides of its war. One side has a kindhearted but naive princess who has to deal with coming into power using what little information she has been given. The other is a gang of soldiers working for an empire that thus far has been shown to be nothing but a greedy warmonger. Multiple episodes have been dedicated to the latter in an effort to make the audience empathize with them as their Empire steamrolls through the realm of the princess. It doesn't work. At worst, the princess shows that keeping her sheltered until she was 12 and then having her issue commands might not have been a wise decision by her kingdom. Meanwhile, the Empire has been tearing apart that kingdom right before it was about to have its food needs ensured. If a solider saves a kid or tells a tale of camaraderie along the lines, so frelling what? They're generic attributes that could just as likely be assigned to kingdom soldiers but those are not the ones invading (or getting the undeserved time on camera). Some writing effort could turn this around in the end and make the kingdom into some sort of villain through conspiracy. It could even keep the Empire as it is and try to turn it into an allegory of well-intentioned US soldiers invading under poor government choices. Neither will matter because the information as presented watching these initial episodes has made it such a chore that any potential payoff just doesn't seem worth it. ..... but after 7 episodes it's only gotten worse with each passing episode. There isn't one single likable character for me in the entire series and I found myself hoping more characters would be killed off each week. I'm also not a fan of the mech design and animation. I'm usually a fan of a lot of the cliches this anime uses but it can't even manage to use them well. So many plot holes. So much forced character development at the end. Such a bad ending. It did have potential though. It was tantalizing enough to keep me watching all through the crappy end. 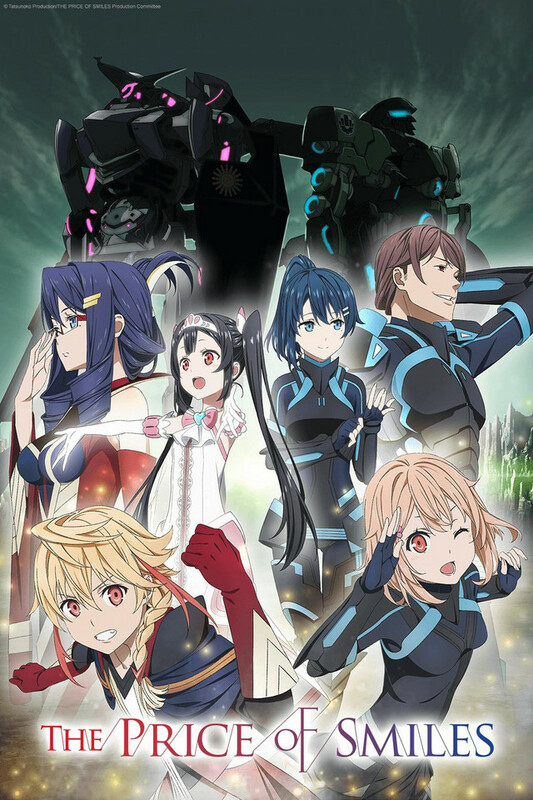 I enjoy shows that are subversive, and this one is kinda trying to be, which was a nice setup for the show; however it quickly squanders that subversion with a constant emphasis on a dumb mechanic that makes no sense in the internal logic of the universe it's based in. The effects of the capstone decision make no sense in-universe. Because the creators HAD SOMETHING TO SAY and didn't care about in-universe cohesion. I normally don't take the time to review a show. The time it takes to craft 'subjective' thoughts into semi-coherent paragraphs is time I could be watching the next show. I consider this more of a warning then review. If you read the title as "The Prince of Smiles" then move on. This is not for you. If you read this as "The Price of Smiles", you may want to move on too. If you think Steven King writes rom/coms this maybe up your ally. This show is for the eager sadist or bored masochist. The low rating isn't for the show, or the story, it's a self evaluation for watching the whole series. The first episode was the highlight of the show: an interesting setting, backstories, mysteries to unfold, and the animation/art was well done(my opinion.) It went downhill fast, more like fell off a cliff. The grinding tragic plot seems forced. They tried to balance this with charismatic characters that never shined enough to care about. The final episode/climax was overly foreshadowed and underwhelming. It was interesting at first. It felt like there was a lot of potential, but it turned to be a disappointment. It ended becoming a game of guessing who is going to die first, and no longer being upset about their deaths. The ending was rushed and really boring...If you really don't have anything else you would like to watch, feel free to try this anime out. It isn't the worst anime, but it isn't going to be anything more than "eh".